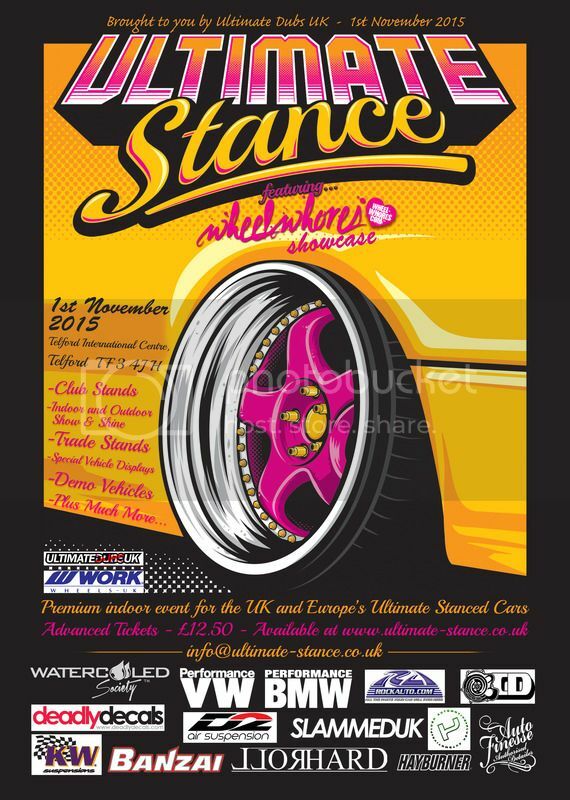 Ultimate Stance is back for 2015 and is to be held on Sunday 1st November 2015 will be bringing together over 250 of the very Best Stanced Show Cars under one roof, along with another 350 outdoor show & club stand vehicles together at the Telford Indoor International Centre (Nr. Birmingham) here in the United Kingdom. We are also pleased to announce that Ultimate Stance will be featuring The Wheel Whores Showcase within one of the halls, bringing together even more great vehicles, attractions, entertainment and bringing to you their great line of WW Merchandise. The venue is located just off the M54 motorway, just a few miles to the west of Birmingham, making it easily accessible located in the centre of the country. The International Centre is a modern building with great facilities and over 100,000 sq.ft of heated exhibition space with car parks adjacent. There are 3 large on-site hotels just a stepping-stone away from the halls & a further 6 hotels within easy reach of the Centre, plus loads of bars & places to eat, so why not make a weekend of it! Plus other attractions to be announced shortly on the website. Advanced Tickets are also now on sale and can be bought via our website www.ultimate-stance.co.uk and save £2.50 when booking in advance and beat the queues on the day! Any further information on the show can also be found on our website www.ultimate-stance.co.uk or 'Like' our Ultimate Stance Facebook Page for all the latest news. We hope you can attend and look forward to seeing you on the Sunday 1st November 2015. Only a week to go now till the show. The entries for the show and shine this year have been unreal. There's a lot of really fantastic motors out there and we've packed the halls out with what we believe to be the best. That's not to say, a few of cars just didn't get in as we could not find the space.